Some males just need a little extra push to enhance their sexual appetite and strength strength and their sexual appetite. is extremely popular. This was how Ville Valo described(*) the album’s genre on yesterday’s Euro Rock Radio interview hosted by CelticAngel. In an interview lasting a little over an hour, and followed by a chatroom (or 2) full of anxious and curious fans, Ville prefered to keep an aura of mystery around the new album, only revealing bits and pieces of information. Enough to keep the fans temporarily satisfied yet curious about the surprises that are to come (and it looks like we’ll be having a few in the very near future). If, on one hand, Ville wasn’t too revealing about the album, on the other hand he was very open when it came to answering the questions sent in by the fans. Some very interesting and amusing questions with answers that…well … you can hear for yourself here at Euro Rock Radio. Poderão ler a tradução desta entrevista no site do HIM Brasil. HIM Official Myspace Bulletin: “Euro Rock Radio, hosted by our very own CelticAngel, will have a very special treat for all the good little HIMlings on Heartagram Day, February 7th! From 12:00 PM – 3:00 PM EST (9:00 AM PST, 5:00 PM GMT, 7:00 PM Helsinki), Ville will be joining them live via telephone starting at 12:30 P.M. To tune in you’ll need to go to http://www.renegaderadio.net/radio. 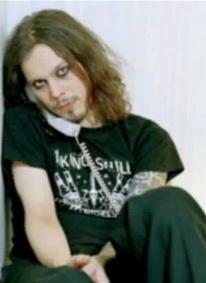 Additional information can be found at their site: http://www.euro-rockradio.com and they will be allowing fans to email a few questions to Ville also.